Day 2 of the Worldbuilding Blogfest is all about history & politics! As an author of an alternate history, this particular component has been the bane of my existence. J To alter history, you need to understand history (both real and alternate), and that means lots of research. Do you know what happened in history in your world? What about the political climate now? What type of government is in play? -An excerpt from a history textbook from this world. Then tell us…is what they teach their kids accurate? Is the textbook biased in any way? -How does the history of this world impact your characters’ present? Do the actions of the characters ancestors impact who they are today? How does your character feel about the history of the world? -Describe the type of government in power. Democracy? Monarchy? Anarchy? How does the government affect the day to day lives of your characters? -Write about your main character’s political views. The Texas Empire Flag is a recreation of the actual first official flag of the Republic of Texas, sometimes known as the De Zavala flag. Will had just turned five when his father was tried for war crimes. 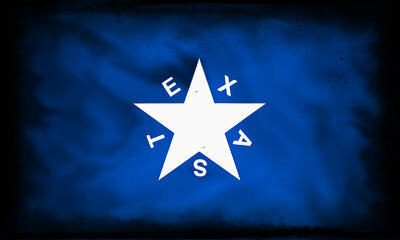 After years of Cold War between the United States and the Texas Empire, U.S. intelligence discovered definitive proof of weapons of mass destruction within the Texas Empire and had information that the then King of Texas planned to reignite conflict between the two nations in order claim additional U.S. soil in the name of the Texas Empire. These threats, compounded by the bitter hatred for the Texas monarchy roused by the Blue Scare of the nineteen nineties, led to a dangerous backroom standoff between the two nations. Many believed that the King of Texas never really intended to use the weapons, and the conflict could have eventually been resolved through diplomatic discussion, but on the twelth day of the standoff, the U.S launched a bomb at the capital of the Texas Empire. No one knows exactly what happened in the top secret meetings that led to the bombing, but the President at the time and his cabinet placed blame on Will's father, General William Cole. They accused him of using "manipulation and deception to circumvent Presidential orders and launch the bomb without proper authority." Some conspiracy theorists claim that General Cole could not have worked alone and that he had simply been the scape goat used to cover-up a massive, deadly mistake made by the entire administration. Whether that was true or not, Will's father did not contest the charges against him. Will knew all this now, but at the time his mother had simply told Will that his father had made a very bad mistake, the kind of mistake that was too bad to just say you're sorry. Even still, his father never had said, "sorry". Will had read the transcripts of the trial so he knew this for a fact. His father had said, "Although I regret the loss of life, I do not regret my actions. I have no doubt that King Antony would have followed through on his threats and attacked the U.S. capital. The hesitancy of the President was about to kill us all. If I hadn't acted, none of us would be here today. I have a son. I had no choice." I have a son. I had no choice. Will had all of this memorized. The recorded words from the trial were the only words his father had ever spoken that Will had been given the chance to memorize. An international tribunal found his father guilty of the "wanton destruction of human life not justified by military necessity," and he was sentenced to death and executed. Will didn't get to say goodbye to his father. His mom had said, "Daddy says he loves you very much, and to be a good boy. You'll see him again in Heaven." Heaven. Yeah, right. But what was she supposed to say? Be a bad boy and maybe you'll get to see Daddy again in Hell? Love this blog hop, the imaginations, the writers are all excellent. I'm so enjoying it, so much to read and learn. SO when does this come out?? Tomorrow? maybe? Please? lol, I guess I can't get anything by you. I'm glad I've caught your interest. That is a very intriguing snippet. And I like that you get the character of Will's father even after he's not there. An intriguing excerpt there. I suspect some of my characters in Searching for Julia would have done something similar. A lot of my saga's history is based on a joint project I'm involved with, so I used politics for this day's theme.